With just days left in the special legislative session, controversial proposals to restrict bathroom use for transgender Texans appear to have no clear path to the governor’s desk. Despite it serving, in part, as the reason lawmakers are back in Austin for legislative overtime, the Texas Legislature could very well gavel out next week without passing a "bathroom bill." With just days left in the 30-day special legislative session, controversial proposals to regulate bathroom use for transgender Texans appear to have no clear path to the governor’s desk. As was the case during the regular legislative session that concluded in May, efforts to pass any sort of bathroom bill — a divisive issue pitting Republicans against business leaders, LGBT advocates, law enforcement and even fellow Republicans — have stalled in the Texas House. And it’s unlikely that will change in the coming days. “I’d say the chances are definitely getting smaller,” Republican state Rep. Ron Simmons of Carrollton, who filed two bathroom bills during the special session, said earlier this week. 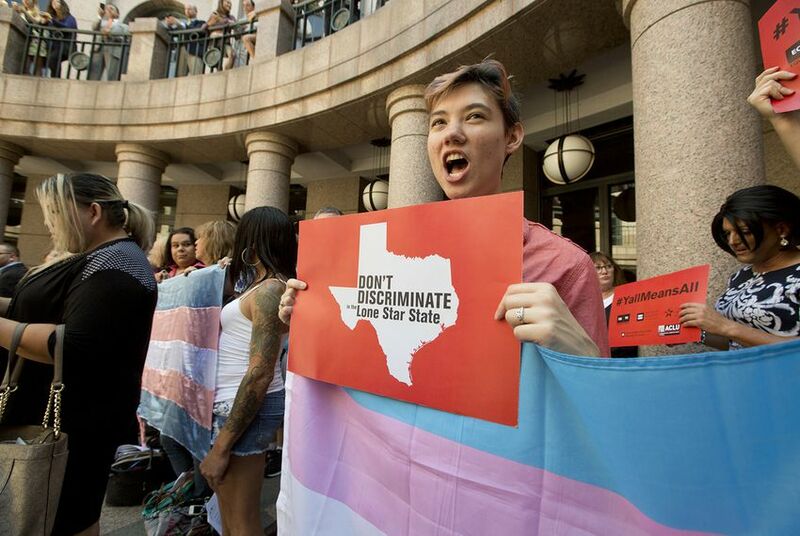 The push to keep transgender Texans out of bathrooms that match their gender identity — a move opponents said was discriminatory and could endanger transgender individuals — largely dominated the regular legislative session between protests, lobbying days, two overnight hearings, legislative bickering among Republican leaders over proposed bathroom bills and, eventually, a forced special session. Restricting bathroom use in public facilities was deemed a legislative priority by Lt. Gov. Dan Patrick. But House Speaker Joe Straus, with the increased backing of the business community, emerged as his most prominent foil on the issue. Gov. Greg Abbott — who for months during the regular session was reticent to voice his support for a bathroom bill — eventually took the lieutenant governor's side and added the issue to his 20-item agenda for a special session that Patrick forced him to call by holding hostage legislation needed to keep open the doors at a handful of state agencies. But amid concerns for the safety of an already vulnerable population and statewide economic fallout, those efforts did little to sway the speaker. When lawmakers returned to Austin in July, the Senate quickly passed its latest version of the bill to regulate bathroom use in public schools and local government buildings based on the gender listed on a birth certificate or Texas ID. It would also nix parts of local nondiscrimination ordinances meant to ensure transgender Texans can use public bathrooms that match their gender identity. Just like during the regular session, Straus has refused to refer that bill to a House committee — the first step in the legislative process. With the passage of a bathroom bill seeming improbable, Republican state Sen. Lois Kolkhorst — the author of the Senate legislation — on Friday suggested lawmakers could be left to address the issue in the future. "Men do not belong in female locker rooms, showers and restrooms and no amount of monetary threats, corporate logos, New Yorker articles or Hollywood hypocrisy will ever change that,” Kolkhorst said in a prepared statement. “Many Texans are alarmed at the effort by some to erode all gender barriers in our schools and public spaces and at the end of the day, there will be future legislative sessions and elections to continue the conversation." Simmons’ proposals in the House, which are focused on prohibiting municipalities and school districts from enacting trans-inclusive bathroom policies, were referred to the House State Affairs Committee. But that committee's chairman, state Rep. Byron Cook, R-Corsicana, has indicated it’s not likely the committee will hold a hearing to consider the legislation. And with the clock running out on the special session – both chambers must adjourn by Wednesday – the demise of those proposals is looking more and more certain. “I mean realistically, if the chairman says he’s not going to give a hearing then I can’t force him to,” Simmons said. It’s unclear whether bathroom bill proponents will orchestrate an 11th-hour attempt to attach the restrictions to another piece of legislation. Similar efforts were unsuccessful during the regular session. Simmons — who earlier this week hadn’t completely given up on his bills — speculated whether they could be rewritten to add to one of the pending education bills. But he was unsure whether he could craft an amendment in such a way that it would survive a likely parliamentary challenge by opponents who could argue that Simmons' amendment was not germane to the bill under debate. Asked whether she was considering ways to amend the language to other legislation, Kolkhorst’s office did not address the issue. Even the head of the House Freedom Caucus — a group of the chamber’s most conservative members who previously tried to attach bathroom restrictions to other pieces of legislation — appeared resigned to not getting a vote on a bathroom bill. Despite the governor’s insistence that the Legislature should go "20 for 20" on his special session agenda, it’s clear that won’t be the case come next week. But it remains unclear where a loss on the bathroom bill will fall on Abbott’s list of grievances. Since the start of the special session, Abbott in interviews and fundraising emails has emphasized other priorities on his agenda over the bathroom bill. Last week, he told the Austin American-Statesman that it was “way premature” to assume Simmons’ proposals wouldn’t get a vote in the House.